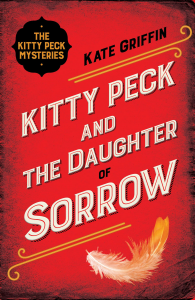 Kate Griffin talks Kitty Peck! Forgive me a small fan girl moment. I can’t quite believe I have Kate Griffin on my blog today. Her Kitty Peck series is just brilliant. Not a single word is wasted throughout. I can’t even begin to tell you how much I wish I’d written these books myself! 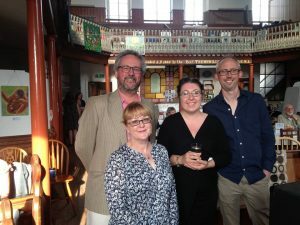 And what’s more, having had the pleasure of meeting Kate at the Tiverton Literary Festival last year, I can tell you she is a lovely person as well- with great taste in Thai food. 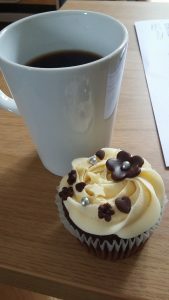 Why not grab a cuppa- possibly with cake- put your feet up for a few minutes, and have a read. First a big thank you to Jenny for inviting me to contribute and also a huge thank for responding to my Kitty Peck books so enthusiastically. As she also delves into the shady corners of history, her appreciation means a great deal! Writing a novel is a bit like mountaineering. Admittedly, climbing Mount Everest is a lot more dangerous than sitting in your pyjamas and eating Hobnobs while tapping away at a laptop, but bear with me because there are definite parallels. When the going’s good you manage to cover a vast distance in a surprisingly short space of time but on a rough day it doesn’t matter how long you slog away – head down against the wind, digging your crampons into the crumbling ice underfoot – nothing comes right. Hours can pass and then when you finally look up, snow-blind from the glaring whiteness of the empty screen in front of you, it’s soul-destroying to find that you’ve hardly gone anywhere at all. Even your ‘footsteps’ – those few feeble paragraphs you managed to hack out – have probably been deleted as you became increasingly dejected, disoriented and unsure which way to go. It’s as if snow has fallen on your tracks, obliterating every trace of your progress. On grim days like this a mountaineer stops, pitches camp, brews up something hot and strong and takes cover until the blizzard has passed. In writing terms, ‘pitching camp’ means admitting temporary defeat. When nothing comes together, it’s best to switch off your computer (or close your notebook if you’re a long-hander) and do something else, preferably something that makes you happy. A break usually clears the head and clears the way. But even then, once you’ve gathered your strength, consulted your charts and stepped boldly back on the trail, the way to the summit can still be treacherous and deceptive. Sometimes you’re so busy concentrating on reaching those far glittering peaks that you don’t notice the bottomless crevasse yawning in front of you. By this I mean the gaping hole in the plot that you never realised was there until you tried to marshal your characters across the final glacier and en-route to the sunlit upland ending of your story. One minute it was all going so well; the next you have no alternative but to find another route to your neatly planned conclusion. Sometimes it can take days to retrace your steps to chart a new way forward or around the chasm. In particularly hazardous conditions you might even have to go right back to the beginning, re-stock your supplies and start out again. More fortunately, just occasionally when you find yourself teetering on the brink of a deep dark void, inspiration strikes and you find exactly the right piece of equipment in your rucksack to enable you to perform a miraculous leap to safety. By ‘equipment’ I mean your plot or your characters. It’s amazing how helpful and inventive they can be when you put your mind to it! Then again, your characters can also be difficult, dangerous travelling companions, particularly the pesky independent ones who refuse to listen to your strict instructions and insist on going off by themselves, getting totally lost in the craggy, uncharted landscape – ie, the parts of your story that you never had any intention of writing. All it takes is to allow a character to wander a few steps off the track you’ve planned and that’s it. They can be missing for days! By the time you realise what they’ve gone and done, it usually takes a major search party (aka a complete re-write) to locate them and bring them back to the trail. At testing times like these many writers would be thrilled to see a St Bernard lolloping to the rescue with a giant barrel of brandy hanging round its neck. (Or, in my case, gin). Now, I’m horribly aware that I’ve pushed my mountaineering metaphor to the limit of human endurance, but there’s one last comparison I’d like to make, and for me it’s very relevant. 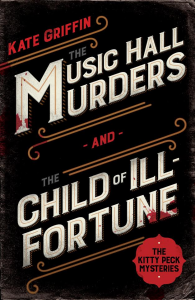 This week, I’m about to embark on the fourth instalment of my Kitty Peck mystery series, published by Faber and Faber. Kitty’s world is a version of London in the early 1880s. The setting will be familiar to anyone who loves Conan Doyle’s wonderful Sherlock Holmes stories. Kitty’s London, specifically Limehouse, is a place where menace lurks in the swirling mist rising from the Thames and where the rumble of a hackney carriage generally bodes ill. Kitty is the youthful proprietress of three tawdry music halls, but she is also more, much more. By the end of the year I hope that Kitty and I will have gone on one last journey together. At the moment, we’re both at base camp. Around 400 snow-blank pages lie ahead and I have to find a way to guide us across that vast and virgin expanse. I know exactly where we’re going. If I shield my eyes and squint into the far distance I can see the sparkling summit – our final destination. I’ve spent the last few months planning and researching. I’ve worked out the route and packed essentials for the journey (well, Hobnobs and gin) but, as I explained above, you can never be quite sure what might crop up on the way. Now as I stare at all that whiteness ahead, I have to admit that I’m excited… and slightly terrified. What a wonderful blog. 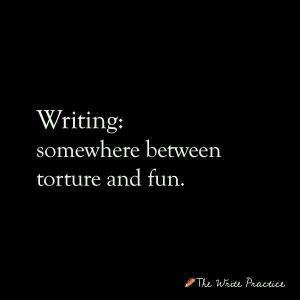 Like many writers, I totally equate with the feelings of terror you have described! However, having read the Kitty Peck books to date, I can tell you, you have nothing to worry about!